This is a quick and easy dish to prepare and very tasty! And see Viva! 's Prawn Crackers article to find out why vegans, veggies and those who care about the environment and Thai workers don't eat 'the real thing'. 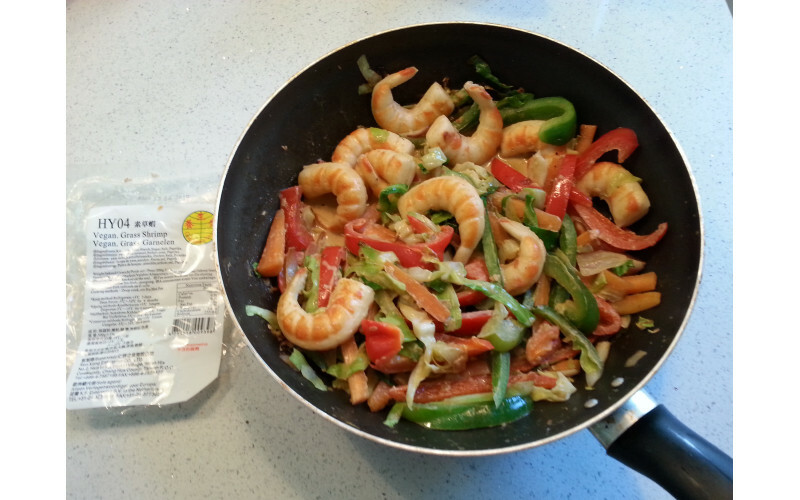 Vegan prawns are available from good Oriental supermarkets or online from Veggie World which sells a fantastic range of vegan meat, seafood and fish alternatives - (some are vegetarian so make sure you enter 'vegan' in the search box). It's worth ordering quite a lot or splitting an order! 1. Put the rice on to cook – brown takes 20-30 minutes from scratch, white 11-12, ready-cooked pouches a few minutes in the microwave. 2. Prep the vegetables quickly. 3. Sauté the vegetables in a wok or large pan for a few minutes, starting with the hard type eg onion, carrots then adding softer ones last, eg beansprouts. Don't overcook - keep some texture to the veg. Add the ginger and curry paste and cook in for about half a minute, stirring continuously. 4. Meanwhile, sauté the prawns in a non-stick frying pan or small wok until they are lightly browned on each side. Cook in the lemon grass paste, garlic and soya sauce and toss everything well. 5. Add the coconut milk to the vegetable stir-fry then the prawns. Heat through gently. 6. Taste everything, adjust the seasoning as necessary (eg more lemongrass/soya sauce/ginger/curry paste/salt as desired) then add a good squeeze or two of lime juice before serving. 7. Dish up the rice on each plate and spoon the veg/prawn dish on top. Serve with lime wedges.